Top Trumps is the name of a series of themed card games first introduced by the UK company Dubreq in the 1970's. Each pack is based on a particular subject, for example cars, aircraft, sports personalities, fictional heroes. Since the 1980's many different manufacturers have produced versions of this game under various names. This is a game for two or more players in which the object is to win all the cards. In principle the pack could be of any size; in practice they often consist of 30, 32, 48 or 50 cards. 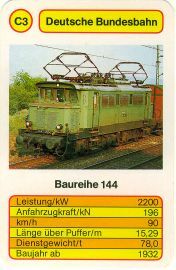 Each card depicts one example of the theme (for example a specific make of car, a named sports player) and a list of around 5 to 8 attributes or capabilities (for example speed, height, power) with numerical values. The game is played as follows. All the cards are dealt as equally as possible to the players and the players hold their cards in a face up stack so that they can see their first card only and the other players cannot see their card. The starting player - normally the player to the left of the dealer - chooses one attribute - for example length. Everyone then reads out the value of that attribute on their first card and whoever has the highest or best value wins all the first cards, collects them and places them at the bottom of their stack. Whoever won the cards then chooses any attribute to read from their next card, and again whoever has the best value of this attribute on their top card wins the cards and has the next turn. This continues for as many turns as necessary, and players drop out of the game as they run out of cards. Whoever eventually manages to collect all the cards wins the game. With some packs it is possible to have a tie for best value of an attribute. If this happens, all players place their top card in the middle of the table and the turn remains with same the player who chose that attribute. The next player who wins cards also collects the pile of cards from the middle of the table. In some packs, some cards have "no data" for certain attributes. If any player has "no data" for the chosen attribute, the effect is the same as if there was a tie. All players place their top card in the middle and the same player chooses again. It is unlikely, but theoretically possible that after a tie the player whose turn it is to choose might have no more cards. This could happen for example in a three-player game, if you win with your last card and then cause three successive ties. Clearly you then have to drop out, having no more cards, but which of the two remaining players takes the next turn? I have not seen any set of rules that covers this problem, and since I cannot see any fair way to resolve it, I suggest that if this ever arises, the remaining players should draw lots to decide who chooses next. Some play that a player who has three or fewer cards left can look at them all and choose in which order to play them. This significantly lengthens the game. 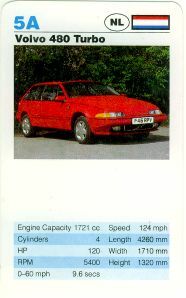 In some Top Trumps decks the cards also have a letter and a number printed in the top left. For example a 48-card pack might have letters A-H and numbers 1-4. This enables the same cards to be used for other games, notably Quartet (Go Fish, Authors, Happy Families), in which the object is to collect complete sets of cards with the same letter (or number). 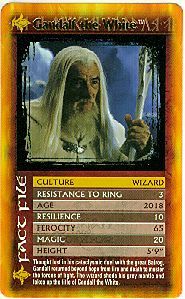 Top Trumps decks have been published based on many different themes. The Wikipedia Top Trumps page and the Ultimate Top Trumps site have information on the history of the game and the various decks that have been published. Top Trumps cards can be ordered from the Winning Moves site. 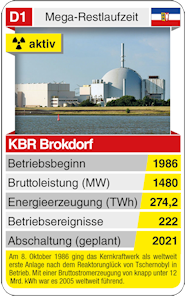 Kulturmeister publishes a range of Top Trumps cards. Themes include Serial Killers, German Protests and Nuclear Power.